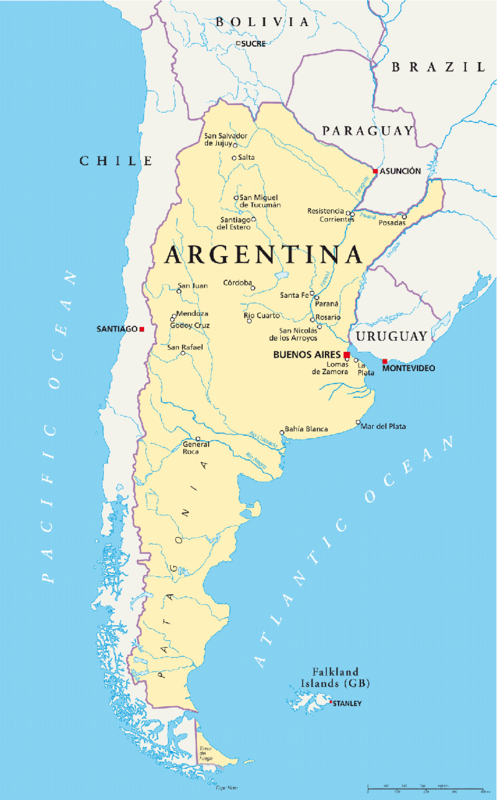 Argentina stretches from desert and forest in the north to permanent glaciers in the south. In between are lakes, vineyards, vast estancias and huge wildlife reserves. Whether you arrive directly or enter via Chile or Brazil, Buenos Aires will undoubtedly feature on your agenda. Here Europe meets Latin America; to the street cafes of Madrid and markets of Paris which are added to the colours of Italy and a touch of chaos, infused with the passion of the tango and the volatility of Latin America. Head to the colourful La Boca district and sample some food in a local labourers’ cafe, the beautiful cemetery, including Eva Perone’s gravestone gives you an insight into Buenos Aires’s rich past. Stretching inland from Buenos Aires, at the mouth of the River Plate, are the huge expanses of flat grasslands and salt lakes that make up the Pampas. This is the heartland of the gaucho tradition and Argentina’s cattle ranches, or estancias, many of which are elegant colonial properties that now take paying guests for an experience of rural Argentinian life. Enjoy the comfort of the homestead or perhaps head out with the gauchos to work the cattle. In the west of the country the Andes run north to south, creating superb mountain scenery. The jewel here is San Carlos de Bariloche. The scenery is breathtaking with great lakes of blue, glacial water fed by the surrounding, snow-capped peaks of the Andes. The area is Argentina’s wine region, ski region and centre for outdoor pursuits; pick your activity or simply relax with a glass of wine and enjoy the view. While the north-west of Argentina is a dramatic desert with scrub terrain peppered with cactus and colonial buildings framed against clear blue skies, the south of the country is the open steppes of Patagonia. Here are vast windswept plains stretching towards the Parque Nacional de los Glaciares. It is a harsh but captivating terrain and the ice-dotted lakes and the massive, rumbling Moreno Glacier is both beautiful and hugely impressive. In the far south Chile curls around the very tip of mainland Argentina/South America before crossing the Strait of Magellan to the Tierra del Fuego. Here is Ushuaia, the southern most city in the world, fascinating in its tenacity and the base for excursions into the Beagle Channel, and across to Antartica. In the north of Patagonia are the wildlife reserves of the Valdes Peninsula. On land are rheas, guanacos (alpaca), armadillo and maras (large relatives of the guinea pig), while marine species include southern right whales, seals, sea lions and colonies of penguins. There is always something to see but activity peaks in the spring and summer (October – April). If you seek majestic scenery, cosmopolitan nightlife, invigorating outdoor activity or cultural diversity, Argentina will certainly keep you occupied. But just when you thought it was time to go home, tantalisingly close and a short ferry ride away from Buenos Aires, lies Uruguay.